Very occasionally, it's possible to see that a game is important or influential before it is released. Most of the time, though, that kind of recognition arrives with hindsight. For the last console generation, the best example is Epic's Gears of War, a game that pretty much everybody agreed was fun and visually spectacular when it launched, but many cooled on due to the muscular dude-bros at the heart of its story. By the time Xbox One and PlayStation 4 arrived, however, Gears' influence seemed to be everywhere, from the feel of its characters to the position of the camera to the importance of cover in its combat system. Add in the second game's "Horde" multiplayer mode, and one could make a convincing case for it being the most influential IP of the entire generation. It just didn't feel that way at the time. In terms of content, Gears of War and Outlast have very little in common, of course, but we may come to see Red Barrels' debut as one of the more quietly important games of the PS4/Xbox One era. I attended a panel at Berlin's Quo Vadis conference recently, which discussed "AAA indies" as an emerging trend, one galvanised by the launch of Ninja Theory's excellent Hellblade last year. Track back to 2013, though, and you'll see that Red Barrels had already laid the groundwork. "We'll never know what the first month sales would have been without PS Plus, but I personally think it was the right move"
That much is evident from its co-founders David Chateauneuf, Hugo Dallaire and Philippe Morin, all of whom had worked at both Ubisoft Montreal and EA Montreal. Red Barrels was started when their project at EA was cancelled and, recognising that single-player action-adventure games were becoming harder to get off the ground at big publishers, they decided to take matters into their own hands. According to Morin, Red Barrels' CEO, starting a studio was the only way to make that kind of game, "without having to worry about all of the stuff that big studios have to worry about." However, it was 2011, and the common perception of digital indie games was out of line with Red Barrels' goal: to establish a model that reduced the financial risk associated with what Morin calls "single-player action-adventure type games", while still offering scale and production values that resembled a AAA release. Despite the pedigree of Red Barrels' team, however, funding Outlast was far more difficult than anyone predicted. "We couldn't find anybody to invest," Morin recall. "We searched for 18 months. We were 18 months without a salary, except for little contracts here and there. "On the VC side, it was still the mobile bubble. The thing we were hearing the most was that they'd rather invest $50,000 in ten projects than $500,000 in us. Maybe on that side there was a lack of knowledge or understanding in terms of the [console] industry." On the publisher side, Morin observed a lack of belief: in the potential for a bigger, more expensive indie game to make money on digital platforms, and in the demand for the horror genre itself. "David [Chateauneuf] and I tried to convince Ubisoft Montreal to let us work on a horror concept in around 2009," he adds. "There was no interest, and the reason mainly was that, although there was a minimum amount of money we think we can make it for, we cannot reach a big enough audience." Ultimately, Red Barrels found an investor in the form of the Canada Media Fund - you can read about that process in more detail here - through which it raised $1 million to add to money from personal savings and loans. Along a handful deals that brought in contractors for below market rate in exchange for a small slice of eventual revenue, the full production budget for Outlast was $1.36 million CAD. When the PC version shipped in September 2013, the Red Barrels bank account was virtually empty. "Every time we did sales projections for Outlast over the next year, they were always below the actual sales"
"We were all in, for sure - but I still have my house," Morin chuckles. "We basically had to launch a game before we ran out of money. There were options to find more money, but at that point we felt that we'd worked so hard to get where we were, it would have been a shame to give away shares in the company just to get a few more months of production." Indeed, resources were so strained that Red Barrels needed revenue from the PC sales to start work on a planned DLC episode and, crucially, a console port. The importance of the console version speaks to another way in which Outlast has proved to be influential: when it made its console debut in early 2014, it did so exclusively on PlayStation 4, as a free game through Sony's PS Plus subscription service. According to Morin, trading what it could have made in sales revenue for a flat fee was, "definitely one of the most difficult decisions we had to make" - one ultimately decided by a narrow vote. PS Plus wasn't entirely new, of course, but it was new to many PlayStation 4 owners, and even those who were used to getting free games every month had rarely seen a new release of Outlast's quality. Psyonix would reap huge rewards by launching Rocket League in the same way almost 18 months later, but here again Red Barrels had laid the groundwork. "Our plan was to start a franchise, and we knew we needed as many people as possible to be aware of that franchise," Morin says. "We also knew we had DLC in the pipeline, so it would increase the number of potential buyers for the DLC. "It was a gamble. We'll never know what the first month sales would have been without PS Plus, but I personally think it was the right move. We didn't have a marketing budget, so it was our way to do marketing without having to spend money." "Our goal was to work for two years, maybe two-and-a-half years tops on Outlast 2. Ultimately it was more like three years"
Looking back, there is little doubt that it was the right move. In the digital games market, where positive opinion can spread virally in a matter of hours, and where a product's tail can be as long as its creator can sustain public interest, units sold had ceased to be the only metric worth considering. The PS Plus launch fit that new landscape perfectly, and also allowed the game to gain the attention of YouTube streamers, who were emerging as the dominant force in the games-focused media at that exact moment. Some of that was simply fortunate timing, Morin admits, but other aspects were a carefully calculated risk - a risk that paid off handsomely. "Every time we did sales projections over the next year, they were always below the actual sales," he says. "The sales of Outlast have always been steady. They've gone down in the last 18 months maybe, but we still sell a lot of units when we do a promotion." The success of Outlast had allowed Red Barrels to think bigger for the sequel, but Morin says that the initial plan was a good deal more restrained than the available resources could have allowed. The second game wouldn't launch through PS Plus, and while the studio could set a higher budget and not be taking as much of a risk as it had with the first game, it was still unclear how much consumers were willing to spend on a digital indie game. "We wanted to make a game that would be the scope of Outlast and its DLC together," Morin says. "Our philosophy was to keep our fans and hope they play full price this time." In the end, the 'full price' of Outlast 2 was higher than the first game - $29.99, where Outlast was $19.99 - but that was a reflection of the time and cost of its development. It had cost $1.4 million CAD to create and release both the PC and PS4 versions of Outlast, but the budget of Outlast 2 rose to around $7 million CAD, with the planned launch delayed by at least six months. "Initially, our goal was to work for two years, maybe two-and-a-half years tops on the game. Ultimately it was more like three years, and I would say three years is the maximum - for the fans, and for us." "In big studios, they can say, 'If you're burnt out we can always give the IP to a different team'. But that's not the case here"
Outlast 2 launched at the very end of April 2017, and Morin says that the fiscal year since that date has been the most lucrative in the company's history. The sales of Outlast 2 are a big part of that, but Morin says that there are days when they sell more units of Outlast - at a lower price, of course, but it shows that there are customers encountering the series for the first time even five years later. "All this stuff is new to us," he admits. "Releasing a second game while having a first game on the market? It's new territory." And Red Barrels has taken to this new territory with gusto. The Outlast series has now sold 15 million units in total, putting it among the most popular new IPs from an independent studio this decade. Red Barrels has earned $64 million in revenue from sales, or $45 million CAD after the distributors have taken their cut. Given that the company's bank account was empty on the day it launched Outcast for PC, Red Barrels' story is a remarkable example of building global success from humble beginnings. However, it's also the kind of success that is impossible to ignore. 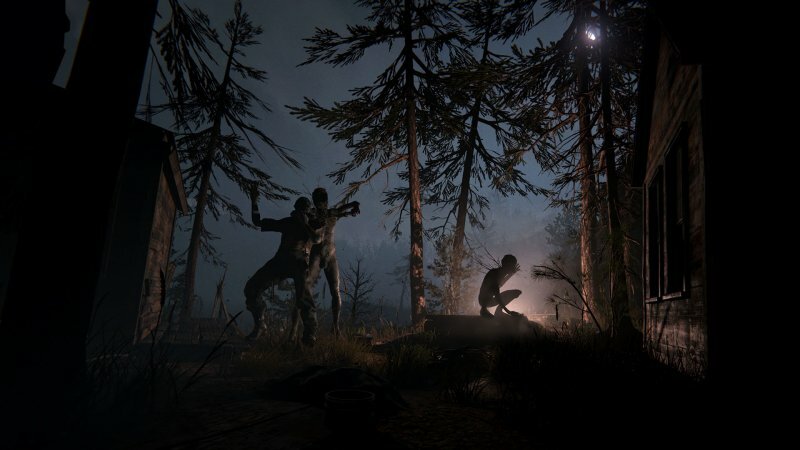 When the team finally shipped Outlast 2, Morin says, there was a strong desire to "do something completely different" for Red Barrels' next project; a well earned reward for five years of grafting on the same IP. But after a long break and some time to decompress, the team came up with an idea that would be "a departure" from the gameplay experience that forms the basis for both Outlast games, but one set in the same fictional universe. "If you'd told me a year ago that the project we're currently working on was going to be our next thing, I would have said, 'Nah, I don't think so'," he says. "It's an internal struggle. On the one side you have to stay motivated as a developer, but at the same time we have to think about stuff as company owners. "We're prototyping, and the way I want to approach this is to get a prototype that we're really happy about, and then figure out the best way to get it done. Are we going to need the same kind of budget? Can it be lower? Right now, I don't know. "All I know is that I always make sure we have options on the table: plan A, B, C and D. When you get to the river, you decide which bridge you want to cross. I always tell the team that, since the studio is owned by developers, our interests as developers is as important as our interests as shareholders. We don't want to change that."